1. The timber is transferred into the treatment vessel. 2. A vacuum pulls all the air out of the sealed vessel. 3. Lifewood CCA or Naturewood ACQ preservative fills the vessel from the tanks located at the treatment plant. 4. The vessel is highly pressurised, forcing the preservative into the timber. 5. The preservative is drained from the vessel back into our storage tanks and a final vacuum applied. 6. The timber is removed from the vessel and left to dry for some time to allow the timber to shrink back to its normal size. Alternatively timber can be steamed to speed up this drying process. Why we treat wood to make it Treated Pine? Wood is our only major renewable building resource in Australia and by treating it with a preservative we can extend its life reducing demand on forests and related sources of wood. We can protect the timber from insect attack and fungal decay and extend its life many times over from what it would last if left un-treated. Wood requires less energy to produce than alternatives such as steel or plastics and because of its lighter weight it creates less of an impact on the environment during transport, manufacturing and other processes. Much of the wood in Australia and New Zealand comes from specially managed sources. The timbers used are species that are plentiful and fast-growing, thereby replenish themselves quickly. Most is grown in managed timberlands, not in old-growth forest or tropical rainforests. 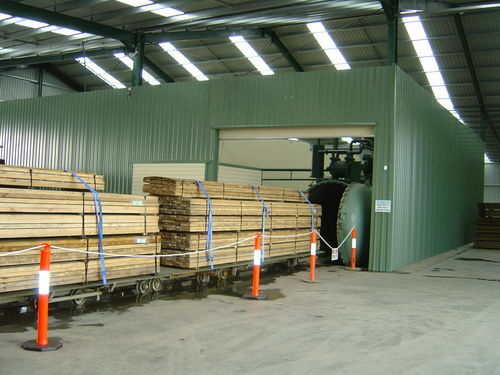 We aim to supply timber that is only from renewable sources in Australia. In extending the life of timber we can make it a reliable and environmentaly conscious choice for building, agriculture and landscaping purposes.